Here is a photo from my 13 week sono. I am now at 14 weeks, and happy to be in the second trimester. It’s amazing how much detail you can see, and I cannot believe there is a tiny little human growing inside me! Little Monkey is so photogenic already. He/She even waved for the camera! (either that or L.M. was still fist pumping from the Swedish House Mafia concert…or sucking his/her thumb?) I’m going with L.M. was saying “Hello” and “Happy Birthday” to Dad last week. GAHH!! CONGRATS Gi AND ZACK!! 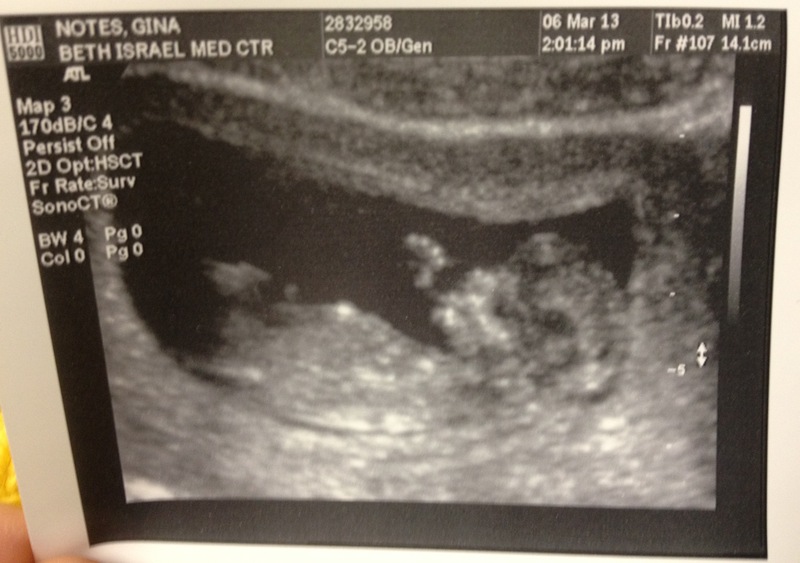 Congrats, Gina……that is very exciting news for you and Zack. It will be fun to follow this exciting event. Keep up the good work you guys!!!! Congratulations on the announcement day!!!! Love Pops!! YAYYYYY!!! Congrats! So excited for you! 🙂 🙂 Little Monkey is gonna be one stylish baby!